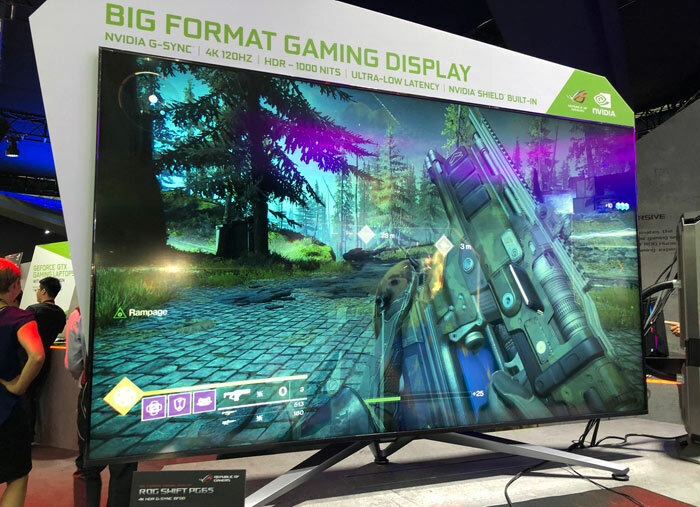 Nvidia announced its upcoming Big Format Gaming Displays (BFGD) back at CES 2018 in January. It sought to address the issue facing gamers attracted by huge new tellies - which are OK for movies but simply aren't up to the job for PC owners as they "lack high refresh rates, low latency , PC-tuned HDR, and G-SYNC variable refresh rate technology," (they usually don't often have Adaptive Sync either). On the same day Asus announced that it it was readying the ROG Swift PG65 BFGD. 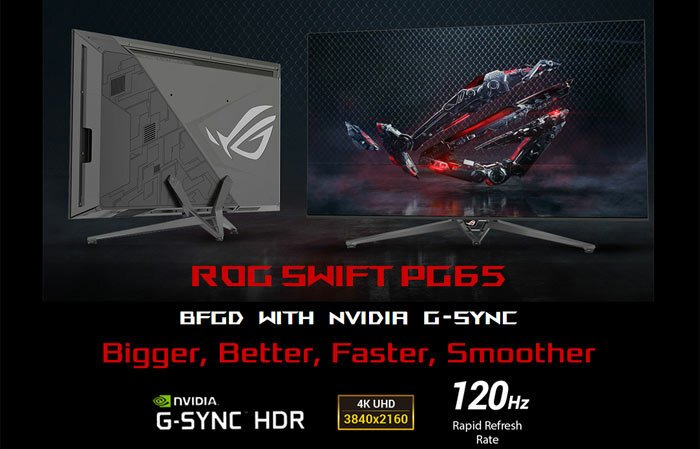 Asus has now prepared and uploaded its official ROG Swift PG65 product pages. At the time of writing the overview section looks complete but the specifications tab is unpopulated - it's blank. However, it does remind us of the greatest attractions of a BFGD and provides some nice views of the monitor. With Asus readying its product pages, at last, we must be much closer to availability than last time we reported upon these monitors. 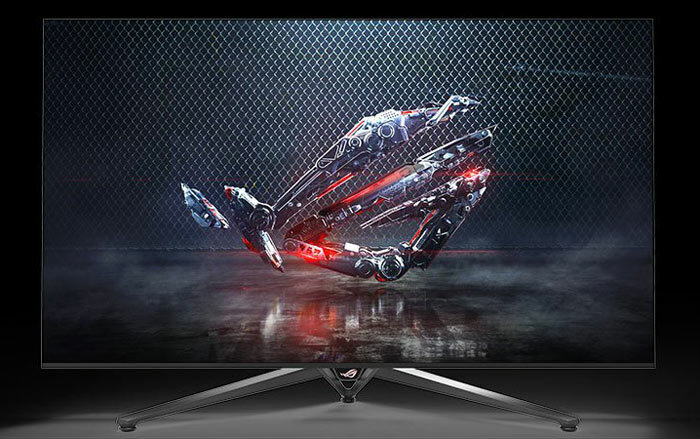 Remember, the smaller G-Sync HDR monitors have only just started rolling out, with their expensive components, so it is understandable that BFGDs will perhaps be even later to market. Given that the 27-inch Asus ROG Swift PG27UQ costs a pound shy of £2,300 in the UK, the pricing for the 65-inch ROG Swift PG65 will likely melt your wallet. Unfortunately, at the time of writing, we don't have confirmed pricing or availability. Remember, other brands will be launching their own BFGDs. In our Computex video coverage we saw HP present its Omen X 65, and it is known that Acer is rustling up a Predator BFGD too. I melted my wallet on a 65" OLED (refurb) for gaming. I thoroughly approve of the extra features here, but also imagine Asus and nVidia think this is worth £5000. Or simply cannot be. TVs are absolutely fine for PC, sure monitors tend to have a better look, deeper colours but you don't notice the difference after a few hours, it's not like you have em side by side to compare! Been using TVs as my primary for ~5 years now, currently use a Sony 43“ 4K HDR set. so its like having 4 32.5“ HD monitors - slightly too big for the resolution IMO. I am using Philips 40” 4k as my main display - and i am very happy with it. The 65“ with flat screen would be unusable for me as primary pc display - therefore not for me. I am happy to see more large monitors with 4k and 120Hz as i plan to buy one in the future. My aim will be ~43” 4k 90Hz+ and curved screen or ultrawide version of that monitor (about 65" 6k i guess). and why the hell the still uses g-sync, get over with freesync already Nvidia!